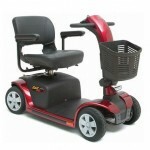 Pride is one of the most notable companies involved in the production of mobility products. This now-global organisation stemmed from a family run business which in 1986 began to manufacture lift chairs. In 1992 Pride extended its product range to include mobility scooters. The models were in many ways a first for the industry since as well as being highly functional, they incorporated sleek styles and designs while offering accessories to fulfil the customers personal taste. 2006 saw the manufacturer celebrate its 20th year of operations. The company’s head office is based in Pennsylvania in the U.S. and has subsidiaries in the U.K., Italy, Netherlands, Canada and Australia. This 9″ scooter with an exclusive one-hand feather-touch disassembly provides luxury at an affordable price. It comes with bright LED headlights, indicators and tail lights that will help you navigate with ease. This scooter is exceptional value for money and also is fitted with low-profile tyres, a back-lit battery gauge, and wraparound delta tiller. It is primarily designed for pavement and indoor activity and with a turning radius of 51.5 inches and top speed of 4mph it certainly won’t disappoint. Ultra portable, compact and pleasing on the eye, the Colt Nine Scooter also features a regenerative braking system that converts friction from braking energy back into electricity to further your battery life. The Pride Colt Sport scooter features front and rear suspension, and is compact, sleek and stylish. Features that come as standard include a handbrake, exceptionally easy disassembly, delta tiller, brake lights and an LED clearance lights. The Colt Sport also includes a new LED battery meter that gives increased accuracy and visibility. 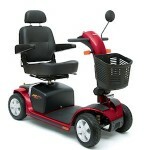 It has a top speed of 8mph, a range of 20 miles and is available in red and blue. The Colt Deluxe delivers an exceptionally smooth ride and comes with mono-shock rear suspension and enhanced front suspension. It’s comfortable too with the captains’ seat and armrests. The Colt Deluxe also features high visibility front and rear lighting and a fully adjustable delta tiller. It can travel at up to roughly 6 mph and has a range of 12-14 miles. The Pride Ranger Mobility Scooter is a class 3, road capable scooter that can travel up to 8mph. Fitted with twin motors to give extra power this scooter is also great on off-road surfaces too. A ground clearance of 7″ makes sure that common bumps on the road are minimised. The seat and headrest are fully adjustable giving you comfort too. With a range of around 25 miles this scooter will certainly take you far and features electronic disc brakes for added safety. It is available in red and black. This elegantly designed scooter provides great performance combined with a strong and sturdy build that can support much heavier loads. 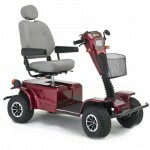 It features fully directional lighting, heavy duty drive train, and an enhanced rear suspension. The scooter is 26 inches wide and consequently delivers optimal stability, especially on uneven surfaces outdoors. The seat has also been specifically redesigned for extra comfort. A top speed of 5.25 mph, a range of up to 18 miles and non-marking tyres all add to the Maxima’s key selling points. « How are Stair Lifts Installed? 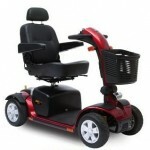 Mobility scooter and stair lift reviews & prices.